As announced February 9 in conjunction with the Chicago Auto Show, BMW has launched the new BMW Installation Services for BMW i and iPerformance drivers, for home charging solutions - including the BMW Charging Station. Along with the BMW Charging Station, BMW Installation Services are part of the premium 360° Electric Lifestyle program of innovative products and services created for BMW i and iPerformance owners. 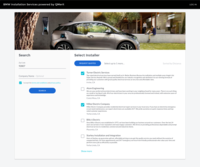 Designed to make e-mobility a pleasure right from the start, the unparalleled 360° Electric program offers smart, simple and efficient ways to conveniently and confidently drive and charge BMW i3, i8, and BMW iPerformance (BMW X5 xDrive40e, BMW 740e xDrive, BMW 530e and the BMW 330e) vehicles. Learn more and get started at www.bmwcharging.com.